Written by renowned journalist, art critic and broadcaster Godfrey Barker who is the arts correspondent for the Evening Standard and contributing editor of ES Magazine, this fully illustrated colour catalogue is an invaluable publication of Adam Birtwistle's portraits. 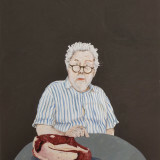 Adam Birtwistle, arguably the foremost contemporary British portraitist, has painted numerous distinguished sitters but still remains "the master of the unofficial portrait...He is the master of the 'off-message' portrait" as Godfrey Barker writes. "There are two sides to all of us, the organised and the dsyfunctional and Birtwistle's genius is that he sees them both." With illustrations of portraits of animals, actors, many composers, and saints, this is an extraordinary collection of Birtwistle's extraordinary artistic and personal vision.